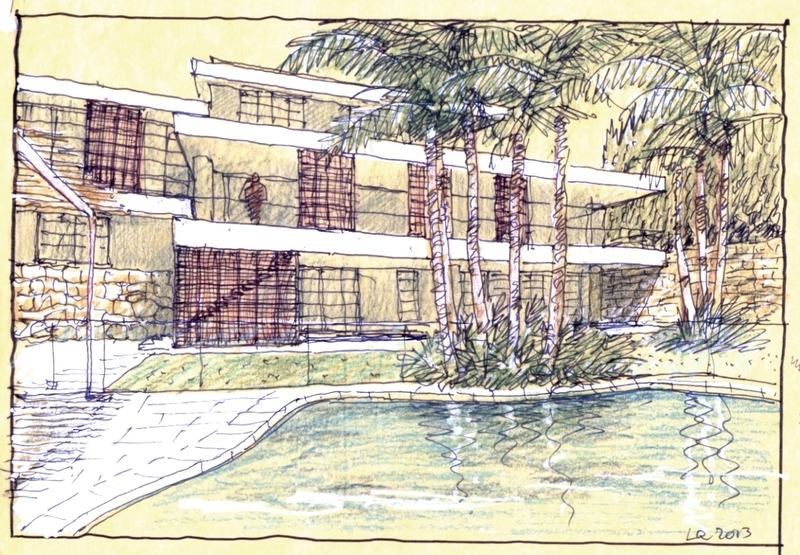 Luigi Rosselli's sketch of the future alterations along the Kambala and Sheldon boundaries. Douglas would have raised a glass. Sydney architect Luigi Rosselli – a retrospective, romantic Italian trained in Milan by Mario Botta and in New York and Canberra by Romaldo Giurgola – has been hired to redesign the old Snelling family home in Bellevue Hill. 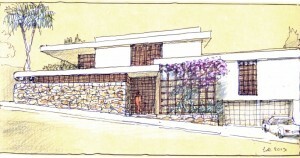 Rosselli's sketch of the future Kambala Road entrance. New owners of the corner property at Kambala Road and Sheldon Crescent are revising the two-storey residence following 1980s obliterations of Snelling's 1950s conversion of two Victorian brick utility buildings. 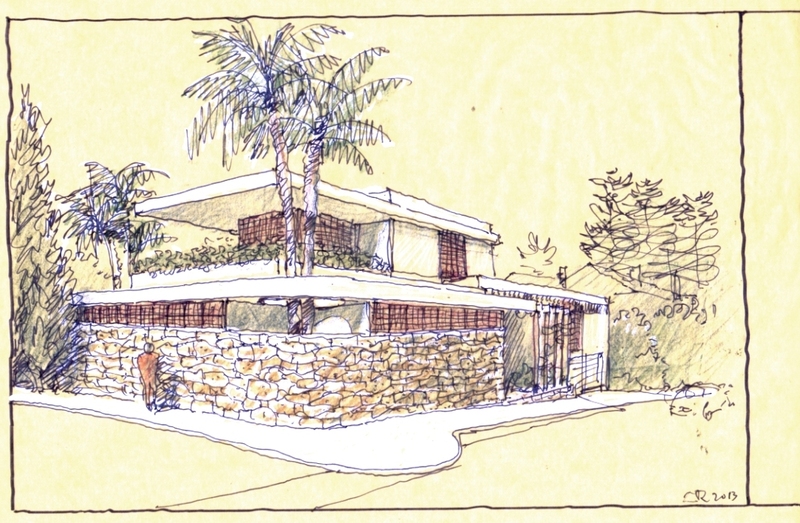 Rosselli's first perspective sketches are steeped with California glamour – refreshing the tropical modern home design concepts that Snelling first interpreted from Beverly Hills and Palm Springs during his 1930s to 1960s heyday. 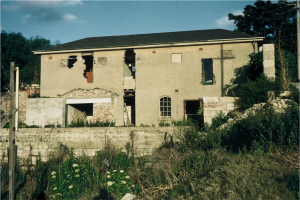 Sydney heritage afficionados – still discovering Snelling after years of neglect by earlier scholars and younger rivals – are likely to appreciate Rosselli's natural empathy and talents, which are consistent with Snelling's humane, nature-integrated and theatrical approaches to mid-20th century architecture. Rosselli's proposed western facade, with the original pool. — A new sandstone wall wrapping around both street frontages with a graceful corner curve. This element alludes to the Art Deco streamlining that attracted Snelling during his first visit to Hollywood in 1937-38 and the 'random' patterns of sandstone that were popular for courtyards when he began designing suburban Sydney houses in the early 1950s. It also relates to the sandstone street wall that Snelling designed for his award-winning 1955 Kelly House at nearby 24a Victoria Road. 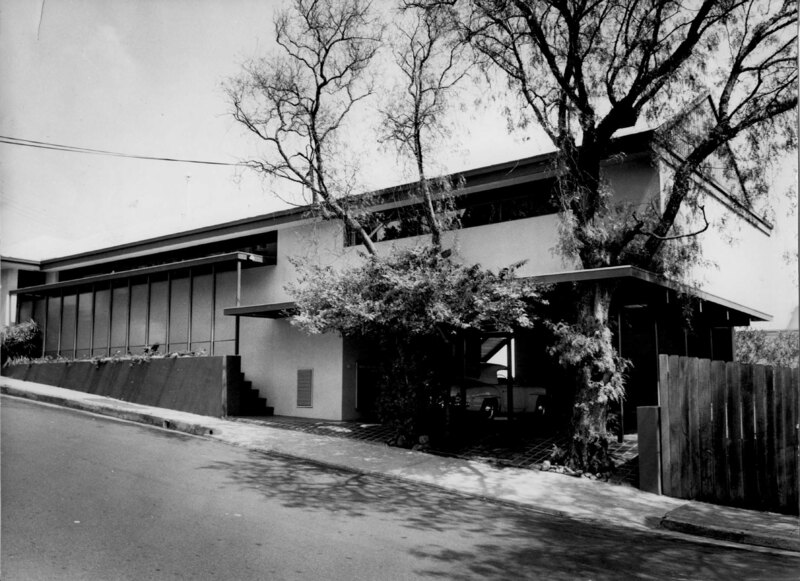 Early 1960s street view of the Snellings' Kambala Road house, photo Max Dupain. — Refreshing the original tropical landscaping to include clusters of palm trees soaring above the flat roofs of the residence, retaining the original 1950s swimming pool, and proposing new plantings of colourful shrubs (yet to be designed in detail). 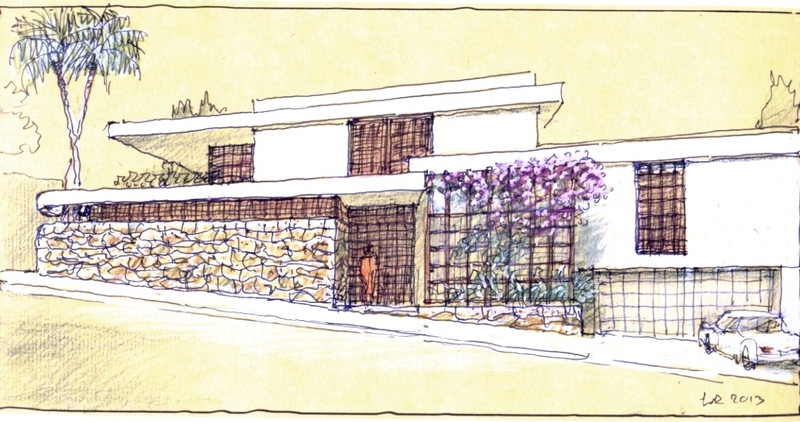 Before sketching his concepts, Luigi Rosselli visited the property, read Davina Jackson's Snelling thesis and reviewed vintage Max Dupain photographs of the Kambala residence and Snelling's other key works. Would Snelling have objected to the Rosselli sketches if he was still alive today? 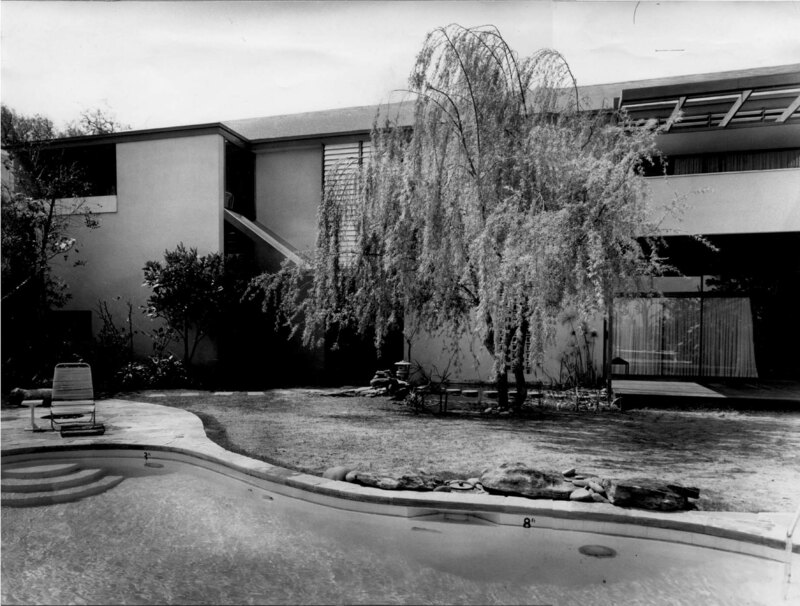 The most obvious discrepancy of architectural style is that Snelling used asymmetrical proportioning for his facade elements, juxtaposing elongated vertical elements on the left with high-modernist horizontal strip windows under roof eaves on the right. Like many mid-century modernists, he obscured the front door – probably echoing an ideological reaction by his 20th century predecessors against the formal entries traditionally designed for grand houses in Europe. 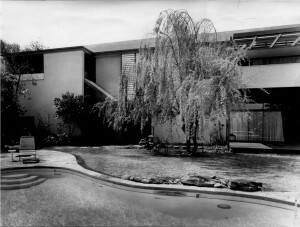 Western facade and garden of the Snelling house, photo by Max Dupain. Rosselli however is a European postmodernist (which means he reinterprets and mixes both modern and historic architectural concepts). His proportioning tends towards neo-classical square windows and symmetrical facade arrangements – and he has included a formal front entrance, centred on the Kambala Road facade (more or less where Snelling had hidden his front door). This classical compositional style remains fixed in Italy's architectural culture, and was globally fashionable during the post-modern 1980s, when Rosselli was educated in Milan, worked in New York and arrived in Australia. On the rear (western) side of the house, Snelling's two staircases between the garden and the upper (street level) floor were both external (at both ends of the building). Rosselli has designed one staircase, set behind a timber trellis in the centre of the garden (west) facade. Snelling bought the Kambala/Sheldon land in 1956, during his divorce from first wife Nancy (Springhill), and shortly after it was subdivided from an estate owned by businessman Sir Mark Sheldon. Mid 1950s snap of the original western facade of the Victorian building Snelling purchased. Fresh from his national House of the Year Award for the nearby Kelly House I (inspired by Fallingwater and other organic houses by Frank Lloyd Wright), Snelling designed this residence to be his own ideal home (upper level) and studio (lower level), set in a modern tropical garden with a central swimming pool, carp and lily pond and special water, flame and lighting effects for his frequent entertaining. As soon as he took ownership, he knocked holes in the first floor brick walls of the main corner building to catch sweeping views to the distant city and gradually developed a new L-shaped residence wrapping around a central lawn and swimming pool. 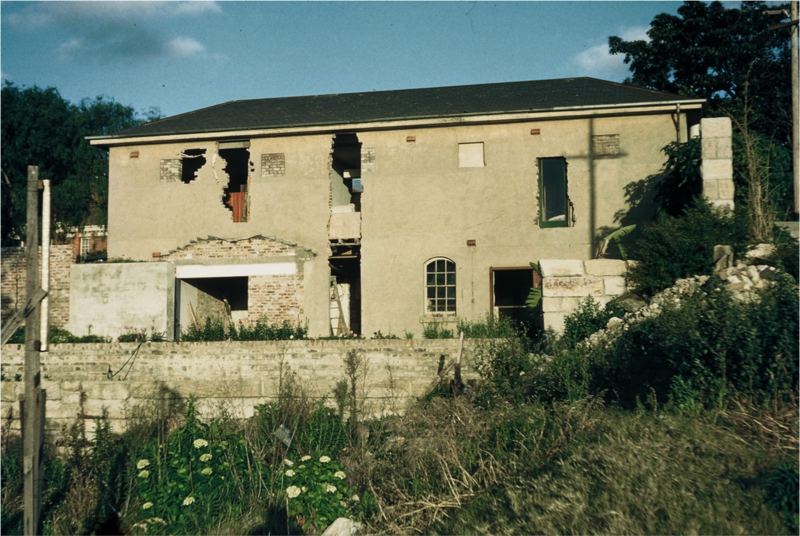 In 1960, he married Patricia Gale, daughter of a neighbouring family of property developers and graziers, and their family lived there until Patricia's premature death in 1976. 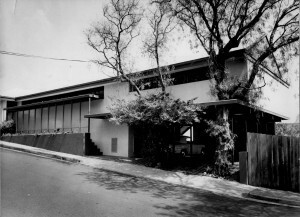 Snelling sold the house in 1977, retired to Hawaii with his three teenage sons and died during a sudden visit to Sydney in 1985.